I’ve had many a granola in my day. The boxed stuff, the bagged stuff, the bulk section stuff, you name it. So, when I say this is the best method I’ve found thus far for cooking it at home – to the tastes I love, to the sweetness level I prefer – I hope you believe me! And if you’re like me, you get intense joy when you find a recipe you want to make and you do a quick spot check of your pantry and JUST.LIKE.THAT, it’s all there and you can make it without even schlepping to the store. This is that granola, friends. SCORE! Oats on oats on oats on oats. Okay, so I’ve been trying hard lately to make more things at home, like this granola, instead of just buying the boxed stuff. And it’s been great. This recipe makes 6-8 servings, so it’s perfect for Nick and I to have during our busy mornings. I make it on Sundays, and then we don’t have to think about breakfast options when we’re still sleepy-eyed and under-caffeinated. The absolute 100% best part about this recipe is that it’s really just a method. And you can pick and choose your favorite ingredients to make your perfect combo. Or, you can do what I did, and see it as a way to use up any leftover odd amounts of nuts, dried fruits, etc. you may have sitting in your pantry. Because, well, that’s pretty great, too! 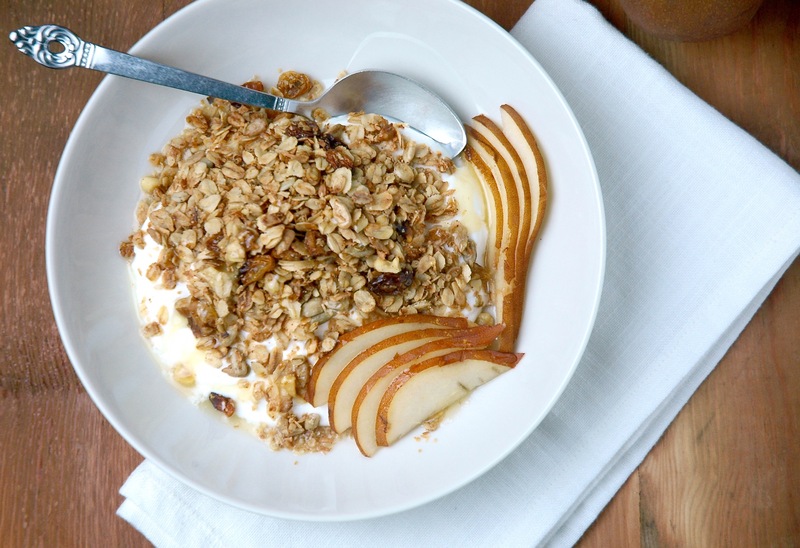 I hope you enjoy this granola recipe as much as we do. Happy cooking and happy eating! 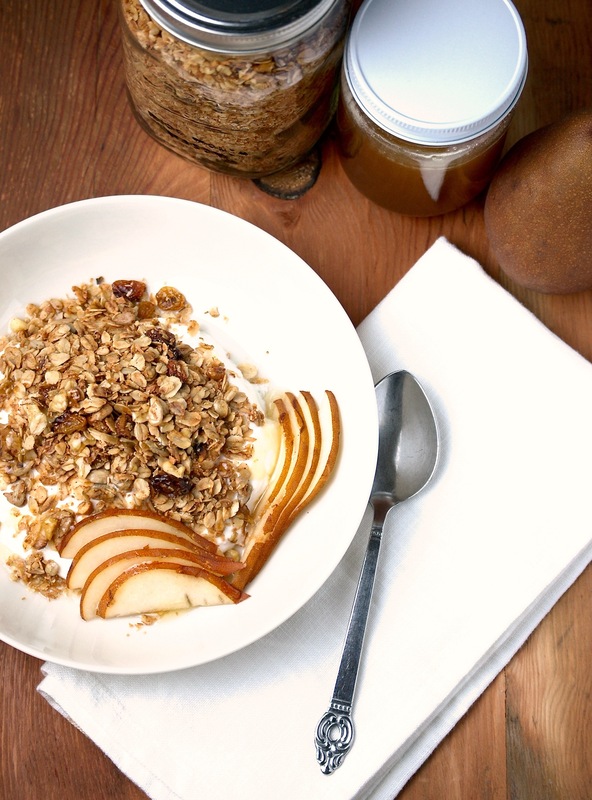 This cooking method produces perfect homemade granola every time! So simple to throw together with pantry ingredients, and better than the store-bought kind. PREP: Preheat oven to 350. Roughly chop nuts. Melt coconut oil in a small pan over low heat. Remove from heat and set aside. MIX: In a large mixing bowl, combine oats, nuts, sunflower seeds, coconut, golden raisins and salt. Once coconut oil is melted, add honey, maple syrup, vanilla extract, cinnamon and nutmeg into saucepan and mix until well combined. Pour wet ingredients onto dry ingredients and stir to thoroughly combine. 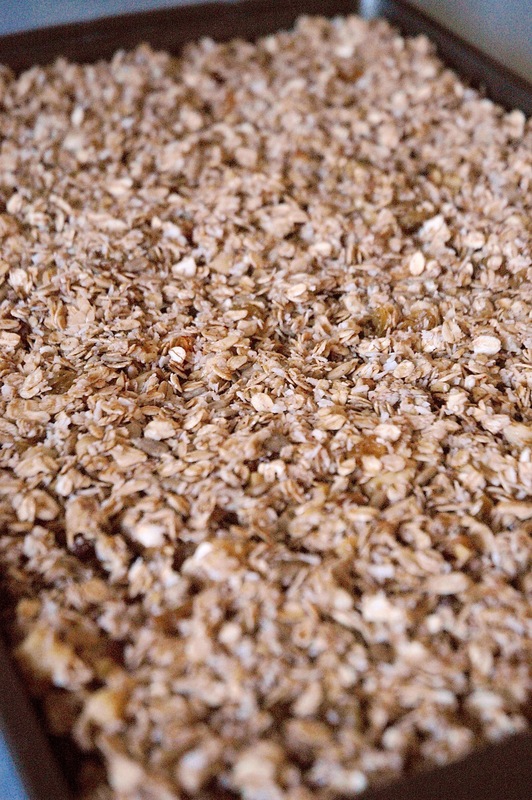 COOK: Spread granola mixture evenly on a large baking sheet. Cook for 10 minutes, toss gently and put back in oven. After that, check granola every 5 minutes, tossing gently until golden brown. SERVE: Serve granola with your favorite sliced fresh fruit and plain Greek yogurt. 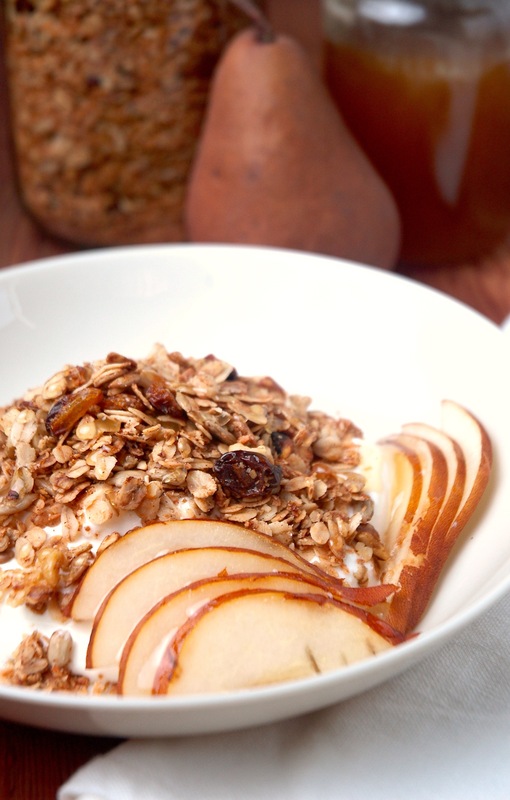 Cook times will vary slightly, so make sure to check your granola often as it bakes. Mine was golden brown and toasty in 18 mins. This makes a slightly sweet granola. Adjust sweetness to your tastes. Granola can be stored in an airtight container on the counter for up to 1 week. Cooking method based on an Epicurious recipe. What’s your favorite granola combo?